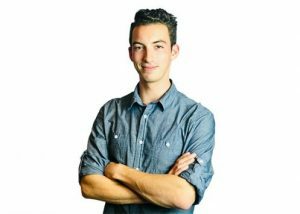 A Spartan student entrepreneur heads for the South by Southwest (SXSW) event next month after his business was selected among the “Entrepreneurial Eight” for the SXSW Student Startup Madness National Championship finals. Josh Cooper, a sophomore advertising management major and active member of MSU Hatch, is the founder of SKOOP, a pedicab company that combines people-moving and micro-advertising for local and national brands. Cooper is the only finalist from a Big Ten school. “We’ve been working hard as a team. For me, it’s exciting to finally get an opportunity to share a little bit about what we’ve been working so hard on,” said Cooper. In East Lansing, SKOOP offers a free ride on pedicabs — basically, bicycle taxis — that carry a digital video display, offering targeted ads to passersby. 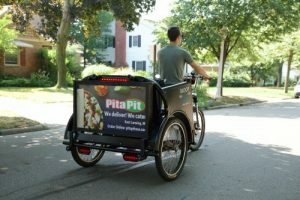 Newer pedicabs will also have passenger-facing digital advertising, with plans to expand the fleet statewide, Cooper said. The venture aims to solve two problems at once. It gives commuters a new, free option for micromobility — short trips where a car would be impractical — and offers businesses targeted advertising. The latter is something Cooper said is superior to what he calls “guessvertising” in traditional media, where ads take more of a shotgun-type approach that is less reliant on data and less certain of results. Student startup businesses representing colleges all over the country entered the competition last fall, with the first round of 64 startups being winnowed down to a round of 32, and then the current eight. The finalists will pitch to a panel of entrepreneurs, venture capitalists and investors at the Austin Hilton Hotel in Austin, TX on March 11 during SXSW.